Spring Peeper Farm: Exciting Stuff!!!! Friday was J. 's school mini Olympics. I brought my camera to take photos. His team did very well. 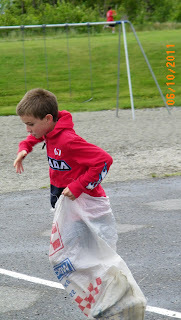 They placed javelin, discus and potato sack race. It lasted till 1p.m. then I headed off to work. 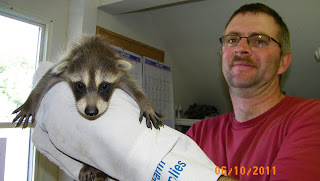 I imagine my surprise when a local contractor shows up with a baby raccoon!! Oh MY GOODNESS!!! It was soooooo CUTE!! It was beyond cute. It kept chattering at us. I can just imagine what it was saying in raccoon talk. Probably nothing for family viewing. He was fixing up a house and a raccoon family had moved in. So he live trapped the momma and the babies. He brought one of the babies in to show us. He was going to move them out of the house. I guess they had damaged the house like nobody's business!! It's amazing that such a cute creature can be so destructive. But who'd think that a cute little mink could be such a cold blooded killer too. Such is nature. I was just so happy I had brought my camera. Then just before closing at 8pm, who shows up but MARK CULLEN!!! HOLY FRICOLI!!!! Can you imagine in our little store. For those of you that have no idea who Mark Cullen is just look here. He's the Canadian gardener's Martha Stewart!!!! Need I say more. Probably not, but I'm gonna anyway. We had a few problems with our plants at the beginning of the season, so our manager took pictures and wrote to him. Mark Cullen takes an amazing amount of pride in anything with his name on it. 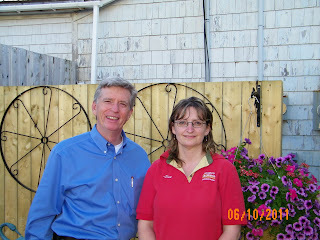 So he was in NS for a garden opening. He dropped in!! He was super nice and answered my gardening questions. Again!!! Thank goodness I had my camera. I got our manager to take a photo of him and I. The funny thing is that I wasn't even supposed to work Friday night. I don't work Friday nights anymore. But because I went to J. 's mini Olympics I offered to work that evening. What luck!!! I would have kicked my behind if I would have missed that. Phew! Ok, I'm calmed down now. Dave went to the farmer's market today. Strangely enough, it was a beautiful day, yet not many people came. Sales were low. Not very encouraging. Tonight I bought 6 americana chicks from a guy I know. They are so cute!! They had a nice hatch. I think they said 36 out of 40 eggs hatched. Alot better than my zero out of 36 average for me. Well this star struck blogger is going to bed. Are we being sarcastic or excited? My what a day you've had!! The olympics, cute baby racoon and National super star!! Good reminder to always have your camera handy w/spare batteries :) Good luck with the new chicks.